Located to the left of the main entrance. The Elsie & Marvin Dekelboum Concert Hall augments the big, sweeping sounds of large ensembles while providing an unobstructed view of the stage. At 970 seats the Concert hall allows for sizeable audiences, yet every seat provides a sense of intimacy. The hall has seating on the main floor, balcony and boxes on both sides of the venue. The choir loft can also be used for patrons as available. The stage features a (partially retractable) riser system that allows all members of performing ensembles to be visible to the audience. Adjustable acoustical curtains help ensure ideal sound quality for performances and recordings. 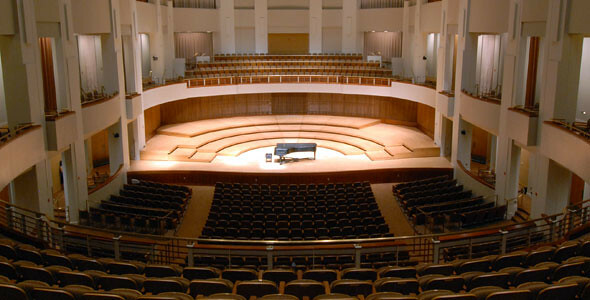 The Dekelboum Concert Hall, like the Gildenhorn Recital Hall and the Kay Theatre, has a specially designed silent HVAC system. Fresh air is constantly provided through a gravity-fed ventilation system that keeps the ambient temperature comfortable, but without the annoying sound of forced air. This silent HVAC system makes the Dekelboum Concert Hall an ideal location for music recording. The late Elsie and Marvin Dekelboum were longtime friends of Clarice and the late Robert Smith. Mr. Dekelboum was a business partner and collaborator of Mr. Smith’s and Mrs. Dekelboum was a respected art collector who held two important pieces by Clarice Smith among her collection. The Elsie and Marvin Dekelboum Foundation naming gift represents the friendship shared by the two families and their collaboration to change the concept of what a performing arts center can be on a college campus. For technical specifications of the Dekelboum Concert Hall, click here.